Loved the apartment and Alicante. Location could not be better with lots of restaurants, bars and the beautiful city on your doorstep. Apartment basic but clean with everything you need provided including WiFi. Albert very friendly and helpful. Muy buenos huéspedes tanto Jane como su pareja, dejaron el apartamento muy limpio y ordenado. Location great, terrazza great. My wife and I stayed in the apartment the whole month of April. You are two minutes from the marina, five minutes from El Corte Inglés, five minutes from Mercadona, ten minutes from Alicantes marvellous Mercado. In short, the location is fantastic. A word of advice in finding the building when you arrive: if you get off the airport bus, walk the full length of the Explanada, turn into Calle Canalejas, when you get to Calle Rafael Terol, TURN LEFT. Your entrance is across next to the shoe store (the numbering system in the street is quite confusing, we were saved by the postwoman on her round. 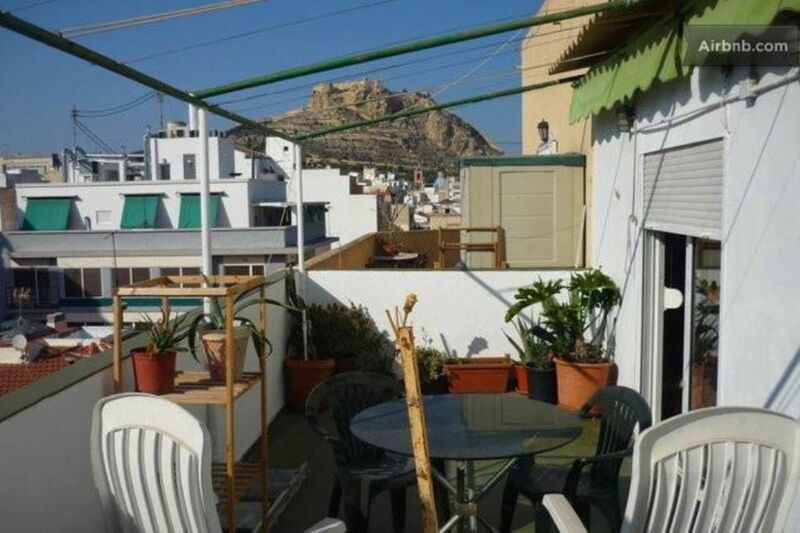 The apartment is not luxurious, but we had all we needed to spend a month enjoying Alicante, the spacious terrazza, and not least preparing the meals we like - after buying fish and shellfish and fruit and vegetables in the supermarkets and the Mercado. The contact wirth our host Alberto was perfect. We did not need any assistance during our stay, but we are sure he would have been on hand if necessary. Appartement très bien situé en centre ville et pas loin de la plage. Propriétaire sympa. Albert est une personne très agréable, à l'écoute de ses hôtes. L'appartement est idéalement situé en plein centre ville. La terrasse est grande et spacieuse et les autres pièces également. Très bonne expérience dans ce logement sous le soleil d'Alicante. Je recommande à tout le monde. Spartansk indrettet, men med en dejlig, rummelig balkon og tæt på by og strand. Lejligheden ligger centralt placeret og er passende indrettet ift. prisen. Vil dog nok være lidt trang, hvis man er flere end 2-3 personer. Aftalen med udlejer ift. udlevering af nøgle blev nemt lavet pr. mail inden ankomst og vi fik lov at blive nogle timer ekstra på hjemrejsedagen, da lejligheden ikke var udlejet den dag. Depositum blev tilbageført uden problemer ca 1 uge efter hjemkomst. arras/deposito de reserva, entrega de llaves realizada por propietario ausente durante la estanciaietario. Hora de entrada: 14:00 p.m. Hora de salida: 10:00 a.m.